Diane was looking for Airline Ticket Wallets to hold her Boarding Pass Invitations and Guest Information Sheet. 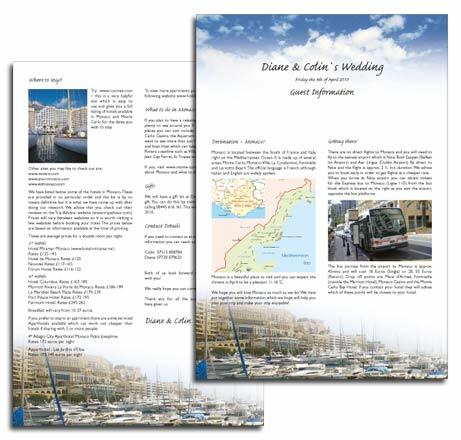 Diane first contacted me about her wedding in Monaco as she wanted something different and after lots of searching on the internet came across my site. After sending them some samples in the post Diane and Colin decided to go for the boarding pass invitations and I started work. Initially I found a selection of images to use as the background and they chose the one they liked best. Diane was excited to continue the theme and so we started work on the Guest Information Sheet. Diane supplied all the relevant information and I sourced suitable photos and came up with a design. Next we started working on the Airline Ticket Wallet that would hold the Invitation and the Guest Info sheet. We continued the Wedded Bliss Air theme and used an image of the sky and clouds as the background. The finished result looked great and would certainly get their guests in the mood for travelling to their beautiful wedding destination. Matching address labels were the finishing touch and saved Diane having to hand write all the envelopes. I thoroughly enjoyed working on this suite of stationery. It was nice to create something which so personal to Diane and Colin and I am sure it would have been very well received by their guests. Shortly after posting out the finished items I received this lovely email from the happy couple. "When we decided we were going abroad for our wedding we both wanted to do something different for our invitations. We wanted to surprise and excite our friends and family about going away! I contacted Kate by email and she sent us some designs to look at. Once we saw the airline ticket design we thought this would be perfect for what we wanted! Kate was very helpful and patient throughout the design process. She kept regular contact with us to make sure we were involved at every stage and that everything was done exactly as we wanted it. No request was too big or small to sort out by Kate. She wanted to make sure that what she created matched what we imagined the invite should look like. The end result was fantastic! The airline ticket and wallet design had evolved into something unique which represented the image we wanted of our wedding. The invites and guest information generated a lot of excitement and enthusiasm among our friends and family! " If you're thinking about an Airline Ticket Wallet to use as part of your Wedding Stationery please get in touch to discuss your ideas.